You might want to delete test response data or remove surveys from your account before rolling out live to real customers. Sometimes, customers can click or tap the wrong button by mistake. Or it could be that there’s been a misunderstanding and an issue had actually been resolved. There are 4 areas where you can delete data from your account. When you archive a Thermometer or List, it is never deleted from your account. It is purely a way to tidy your screens, to ease your workflow. All reporting data will remain inside your account… it will show inside your reporting dashboard, it will show inside your exports should you choose to export to CSV, and it will contribute to your main dashboard. 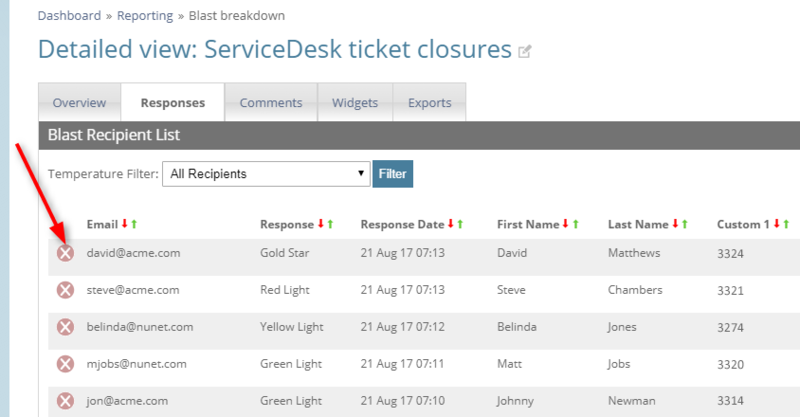 Visit the Blast Breakdown report containing your response. Click the red cross shown below to delete that response. It will no longer form part of your response data within your account. It will also no longer appear in your exporting. There is no opportunity for a recipient to reset an Embedded Thermometer response. For Email Thermometers, click the delete button as shown above, against the relevant response.. 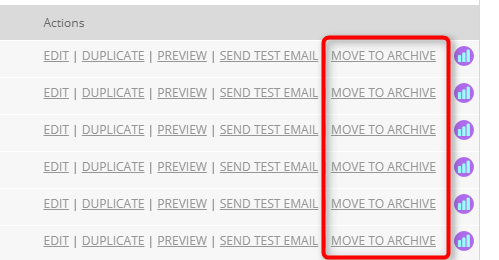 Recipients can reset their own responses within 15 minutes of clicking. You can also delete an entire Embedded or Email Thermometer Blast. To do this, visit “Reporting” and click the red cross next to the Blast you wish to delete. You will be prompted to confirm this choice. IMPORTANT if you delete a Blast, all responses within it will be deleted and will not be retrievable. Deleting a Blast will not delete the associated Thermometer survey template.